As per usual, whenever I come home on a break from university my Mum, sister and myself go on at least one major shopping trip. We are each others’ hype men and harshest critics: we build each other up when we pick out items that look fantastic, but ruthlessly tear each other down if we make a fashion faux pas. On our latest shopping trip, we had one objective: start working on our summer wardrobes. I grew out of all of my swimming costumes last summer so I was in desperate need of a new one. Plus, rather than going on a spending spree a couple of weeks before we jet off to Spain in July, we figured that spreading the cost over multiple trips would be a little more merciful for our bank balances. Don’t get me wrong: a number of items I purchased last summer will make do for this summer as well. As much as I wish for it, my purse has yet to become an infinite source of money. However, I was in desperate need of a summer wardrobe refresher. I decided to focus on the essentials (my new swimming costume) plus a couple of key pieces which will help to refresh last year’s wardrobe and insert some key 2015 trends. As you can see, I colour coordinated many of my new purchases ready to wear on the beach this summer. I’ll be using the kimono as a cover-up whilst sunbathing in my bikini, and the flip-flops will be perfect for walking on hot sand. I chose a neutral pair of chino shorts so they can be part of my suitcase-friendly capsule summer wardrobe, matching pretty much every t-shirt, blouse and vest I own. Plus, chinos are light and airy, perfect for humid summer days in Spain. I don’t expect to tan this summer (that would be far too ambitious a goal), but I chose vests and short-sleeved t-shirts so I can start building up my usual covering of freckles on my arms and shoulders. They’re all made of light material, and aside from the Of Mice & Men vest everything is fairly loose-fitting. This should be more comfortable as the temperature rises. What do you think of what I’ve bought? What are your summer wardrobe essentials? Let me know in the comments or on Facebook or Twitter. One of my favourite pass-times is rooting through men’s clothing shops to find styles, cuts and accessories that you wouldn’t find in the women’s section. Last time I visited Topman, as well as picking up my new favourite checked shirt, I also purchased some collar tips. At £7.50 the tips were a little pricey, however considering how often I wear them out, I think they were good value for money. Collar tips are a nice alternative to wearing a necklace if you’re wearing a collared shirt or blouse – dress them up with a chiffon blouse, or wear them casually with a denim shirt. Here are my top 10 favourite collar tips available at the moment. Once my student loan comes in, I will seriously be considering picking up a couple of pairs of these. What do you think of my choices? Let me know on Twitter or in the comments! Today, I paid homage to my primary school uniform with this cute shirt, jumper and skirt combo. I couldn’t just leave it at that, though: playground-chic is so last year. If there was a school for punk rock, I’d be so there. As a fan of the Hard Rock franchise this jumper is one of my favourites, and has memories of chowing down on a chicken club sandwich at their cafe on Pier 39 in San Francisco. But it’s a little plain and I’m not a big fan of crew necks, so I decided to add a little texture with a white chiffon blouse and multi-chain necklace, both from New Look. I finished off the look with a simple black skater skirt from Select. At only £8 it was a steal, as well as a wardrobe essential. 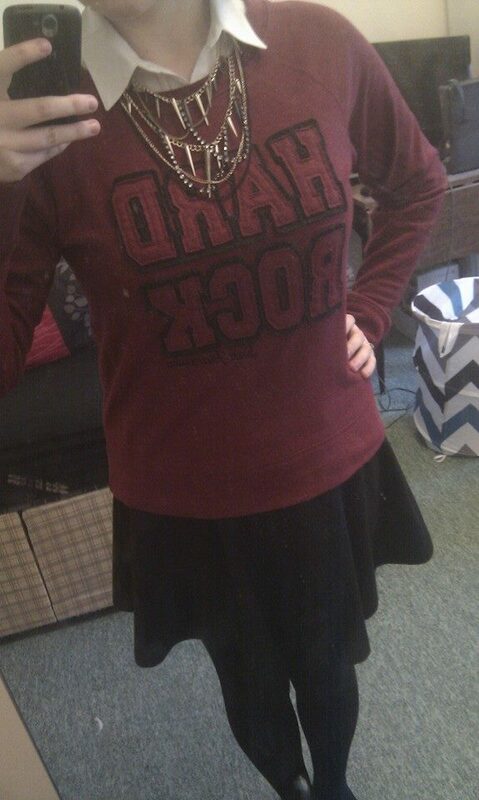 I mean come on, who doesn’t need a black skirt in their lives? To grunge this look up a little, why not add a leather-look skirt, checked pleats, or a statement collar to make things more interesting. You know how it is: you’re scrolling down your twitter feed having the time of your life, and all of a sudden you look at the time to see your bus leaves in 20 minutes. That, unfortunately, was me this morning, so all I could manage to do was chuck on the first clothes I saw before I left the house. Thankfully, it all turned out rather well. I am so working the double denim. This particular outfit has a lot of memories for me, as most of the pieces were bought on my holiday on the California coast and in New York in July/August 2013. The vest was bought at Club Tattoo, a tattoo parlour (hence the name) and clothing/accessories store on Pier 39 in San Francisco. Even eight months later the design is still in great condition, and the fit is super flattering for my body type. 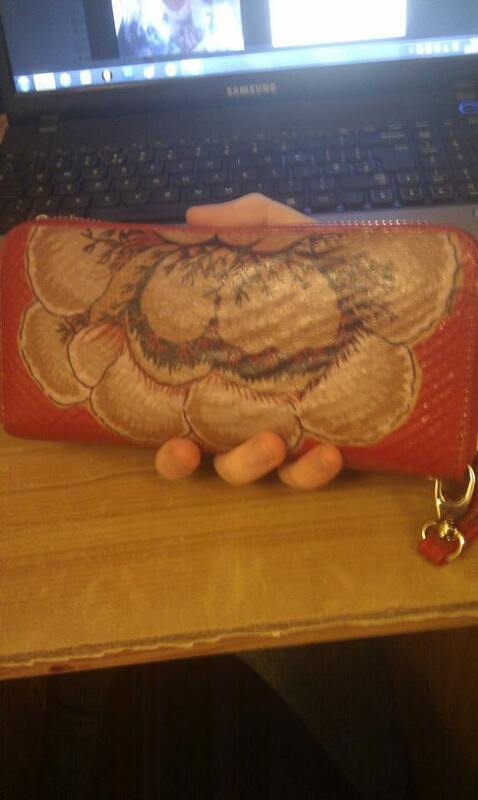 Please, bow down and appreciate the beauty of this purse. I also bought this gorgeous purse/clutch bag there too, and is to date the most amount of money I’ve ever spent on one item of clothing or accessory at $45, or roughly £30. 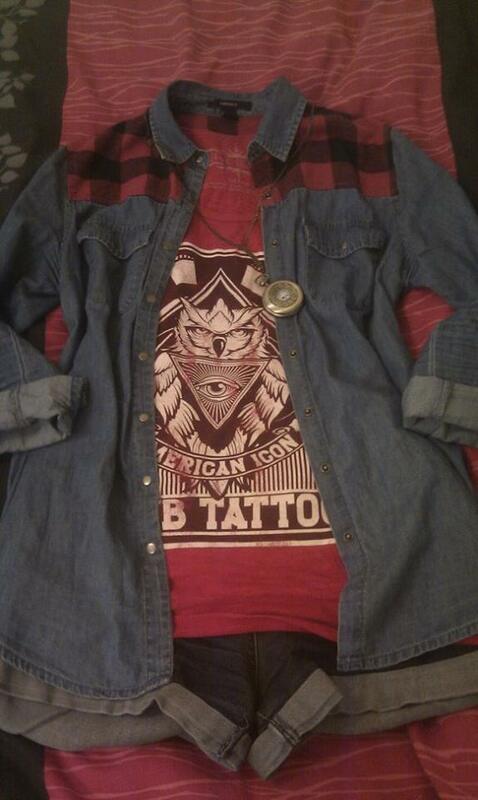 The denim shirt I also bought in America, this time at Times Square’s branch of Forever 21. I love this for its red checked shoulders, which add a bit more colour and coordinates nicely with the red of the vest. This was also a pretty good value purchase, however it wasn’t until I tried on the shirt at home that I realised one sleeve is slightly tighter than the other for some reason. So, not massively pleased with the quality of the piece, but the shirt’s still lasted well and I liked it enough not to bother returning it. The shorts are a staple of my wardrobe; bought at New Look a good few years ago, they’re high waisted and still such a great fit. Damnit, I can’t think of any time-related puns. 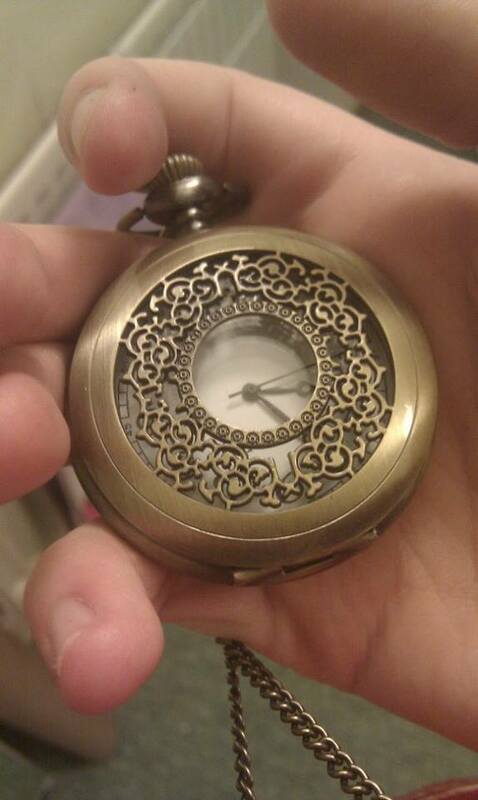 Here’s a close-up of my necklace, an ornate pocket watch on a bronze chain I bought last year in a random gift shop. It was fairly pricey – £20 – but I absolutely love it, and it goes with pretty much every outfit in my wardrobe. It also ties in nicely, colour-wise, with the brown lace-up boots I wore with the outfit. I never put batteries in the watch, though. Maybe that’s why I’m late to lectures so often. This outfit is a favourite because of the colour coordination. Whilst I can appreciate outfits that clash, I don’t feel comfortable unless my entire outfit ties in nicely together. I’m also really liking the double denim which, if pulled off well, is definitely a popular choice right now.